Many of us who have babies are familiar with some recent formula recalls. It has made a lot of mothers second guess ever giving formula to our babies, and instead opting to exclusively breastfeed our babies. Not only breast milk and breastfeeding is beneficial for baby and mom , it is absolutely free. For the first year of baby’s life, there is absolutely no need to spend a dime on feeding our babies if we let our bodies do what nature intended them to do. For some of us, however, as much as we want to exclusively breastfeed, we have to succumb to the bottle when we have to go back to work, if we are taking certain medications, or just for some time off for a few hours. That is why breast pumps can absolutely be a mother’s best friend. It would be wonderful if all of us could nurse our babies when and wherever they are hungry. Unfortunately, that isn’t always possible. That is why having a breast pump has been an absolute lifesaver. With the right breast pump, a mom can simply pump and store milk for those occasions when she just can’t breastfeed. While I like to think we live in a world where a mother can breastfeed her baby if she is in a restaurant, or out grocery shopping, or even at the park, it is clear that we can’t. While there are laws which protect breastfeeding mothers from legal ramifications should she expose her breast in public to nurse, women often still have to fight charges or discrimination. People still openly gawk at a woman who is feeding her baby from her breast in public. As unfair as this is, it makes it simply easier to use a breast pump before leaving the house to feed the baby from the bottle while out and about. Breast Pump: When to use it? 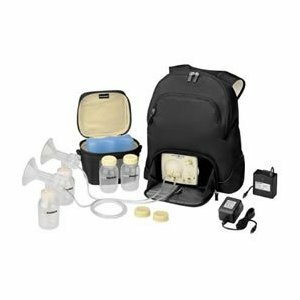 Breast pumps can also be a mother’s best friend in the event that there is medication which needs to be taken for a condition. While being treated with certain medications or medications given for certain tests, a mom can prepare by pumping enough extra milk ahead of time, and then during the course of treatment pump and dump out the milk to sustain her milk supply until she is ready to breast feed again. Breast pumps can also be used in the event that a mom just wants the night off. Whether it is for a romantic dinner to rekindle the spark with her spouse, or whether it is for a night out with friends, having an extra supply of pumped breast milk can save the day. It allows a mom to get a babysitter and not have to worry about feeding the baby. It takes the pressure off, even for just a night, and can give a woman some freedom to do what she wants to. Having a night off can also often mean that dad can enjoy the wonderful bonding experience of feeding and caring for your little one, which can be extremely beneficial to both of them. For working moms who want to continue to breast feed, breast pumps have allowed women to go back to work. Prior to breast pumps, moms would often have to resort to formula feeding when it was time to go back to work. That isn’t the case any more. In many countries, when a woman returns to work after maternity leave, the employer is required to give a breastfeeding mom access to a room with running water where she can use a breast pump in privacy and comfort. This allows her to continue to maintain her supply and continue to breast feed, even while away from the baby. Breast pumps have given women more freedom than they have ever had in the past. Not only can a woman return to work, she can enjoy a night off or time away without having to worry about how the baby will be fed. By using breast pumps, women can hold onto their freedom while continuing to give their babies the very best. Thank you so much for sharing. I can certainly see the benefits! A breast pump was my life saver way back when. It’s nice to be able to take a break, if even for a few hours. Yeah, this is definitely the way to go! quite necessary and truly life savers.